A parea is a circle of friends, a group of people who derive pleasure and have fun based on the simple fact that they are together. In a parea, enjoyment comes from sharing about people’s lives, our happinesses and sorrows, and our ideals and philosophies. Greeks believe that this is not optional, but a necessary part of growth. A circle of friends is how we travel through the cycle of life. The parea is true expression of the Greek spirit. Friends gather together to talk about every subject under the sun, go out for delicious food, and of course, express their spirit through dance. 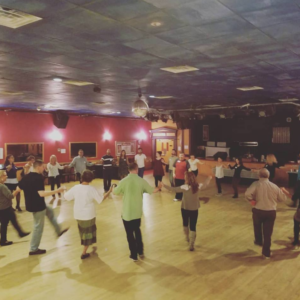 It is not a coincidence that many dances are performed in a circle, emphasizing the importance of the parea and welcoming the whole community into the dance. The members and dancers of the Lykeion see ourselves as one big parea, and we would like to welcome as many people as possible into our circle. We are part of a larger parea, part of the community around us, and we strive to enrich our community. To learn more about our parea, our organization, and our programming, and to enjoy dancing to live music performed by Sandy Theodorou and Rohan Gregory of REVMA, all are welcome to attend our annual Open House between 7:00-9:00 p.m. on October 24th at the Greek-American Political Club in Cambridge, MA. More details are available on our events calendar. We hope to see you there!